Bourrié was commissioned by the Atlanta Committee for the Olympic Games to create an image for sailing. He was named the Official Artist by the Atlanta Olympic Organizing Committee. André Bourrié, the distinguished maritime and landscape artist, is one of France's foremost contemporary masters. Bearing the distinction of official Painter for the French Navy, he has received innumerable awards, such as the Gold Medal of the prestigious "Salon de la Marine" and the Gold Medal of the "Salon des Artistes Français". Born in Montpellier, France in 1936, André Bourrié was abandoned by his parents at an early age. His father deserted the family in 1941, and his mother followed suit in 1945. He lived alone until a woodcutter uncle, finding the child "sullen and unsociable", placed him in an orphanage. The harsh period was critical in Bourrié's coming of age and possibly the most important influence in his becoming an artist. During this time, he developed an affinity for his immediate surroundings -- in his words, "listening to a place and a moment in time." These intuitive characteristics are reflected in his paintings. As a young boy without parental security and guidance, he found solace and joy in colors, light, textures, and forms. It is not a coincidence that he became a self-taught artist with such a melancholic start in life. As an adolescent, he worked as a ceramist. Though he abandoned this first job after a kind philanthropist offered to provide him with an education, it taught him the management of colors. After completing his formal education, he sought a job which would call for more artistic initiative and found one as a decorative painter, a meticulous and respected artistic profession. The latter immersed him in a new world of artists and creations, and allowed him to join stimulating group discussions among artist and participate in a lively sharing of ideas and styles. 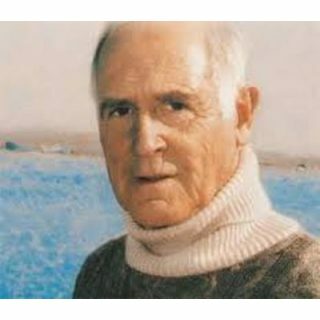 For years he lived outdoors, traveling and exploring the harbors, seaside and beaches; homes, monuments and cities which are all subjects of his art today. He devoted his leisure time to drawing and painting "for himself". Once ready, he decided to present his paintings in shows. André Bourrié applied strong clear - sightedness and unwavering personal will to attain his dreams of becoming an artist. By 1973, after twenty years of his place of employment and his workload was lightened, but still he did not make an escape from financial security -- not even after he had been presented the silver medal of the Solon des Artistes Francais. Indeed he waited until 1979-- 43 years--to free himself from the constraints of full -time employment. The wait was worthwhile. 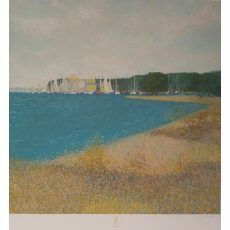 Today, André Bourrié is renowned for his magnificent paintings of the French countryside and sea. His works are acclaimed for their brilliant use of sun-drenched, white light and rich, iridescent palette. His paintings are in private and institutional collections through out the world, including France, Japan, The United States and beyond.